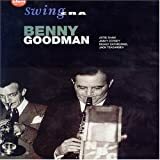 Benny Goodman learned clarinet at his synagogue, bolstered by two years of classical training. He made his professional debut at 12 and became part of the rich Chicago jazz scene, steeped in the music of New Orleans. Goodman first recorded in 1926 and spent several years as a first-call musician in New York. His 1934 band was broadcast on the popular “Let’s Dance” radio show which aired coast to coast. An otherwise unsuccessful tour in 1935 ended in a smash hit in Los Angeles where the audience went wild. Thus, it is said, swing was born and Goodman became its King. The band included trumpeter Bunny Berigan, vocalist Helen Ward, and Gene Krupa, the explosive drummer who was seminal to the band’s swinging sound. In 1937 Harry James, Ziggy Elman, and Vido Musso joined the band. Success was due to Goodman’s hiring the best arrangers such as Fletcher Henderson (whom he credited with creating the swing sound), and the best players (whom he rehearsed hard). He was one of the first to feature band members in small settings and the first to racially integrate a band with such greats as Teddy Wilson, Lionel Hampton, Ella Fitzgerald, and Jimmy Rushing. Goodman’s 1938 Carnegie Hall concert was a first for a jazz group in such a venerable setting and remains one of jazz’s high points. The band enjoyed many top ten hits a year and was featured in several films, the first being The Big Broadcast of 1937. Goodman’s appearance as an actor in the film A Song Is Born (1948) is delightful. After he disbanded the orchestra in 1949 he continued to organize groups for tours and recording sessions. As a virtuoso clarinetist, he became the first jazz musician to gain critical acclaim in the classical world, as early as 1935, and he continued to perform with many symphony orchestras.